Field of Light art installation, and global phenomenon, by internationally acclaimed artist Bruce Munro, is coming to Australia for the first time. As part of Ayers Rock Resort’s commitment to arts and culture, it’s hosting the biggest Field of Light installation to date at the place that inspired it - Uluru. Bruce Munro and his team will install more than 50,000 slender stems crowned with frosted.. Entered into the Australian Tourism Hall of Fame, Sounds of Silence offers the best of the Red Centre distilled into four magical hours. An evening of dining under the sparkling outback sky. Your Sounds of Silence dinner experience begins with canapés and chilled sparkling wine served on a viewing platform overlooking the Uluru-Kata Tjuta National Park. 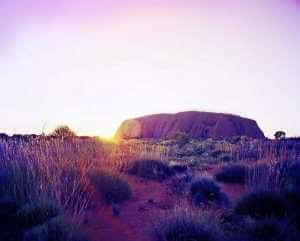 As the sun sets and darkness falls, listen t..
One of the best ways to experience Uluru and the sprawling domes of Kata Tjuta is on an Ayers Rock Helicopter tour. Your aerial view will take in Uluru and the magnificent red desert, all the way to the striking rock formations of Kata Tjuta. During your Ayers Rock Helicopter flight you’ll see more than 36 massive, dome rock formations make up this natural wonder, a gathering of fantastic, striate.. Enjoy a bird’s eye view of Uluru and Kata Tjuta, out to Lake Amadeus, Kings Canyon and Gosses’ Bluff on an Ayers Rock scenic flight. During this exhilarating experience, you will have a chance to truly appreciate the natural beauty of Uluru and Kata Tjuta. The Ayers Rock scenic flights are 40 minutes long, giving you the perfect amount of time to take in the wonderful sights and stunning desert fe..